A cell’s ability to accurately segregate genetic material during division is essential for the survival of an organism, and errors can result in developmental defects and diseases. Dr. Kapoor’s laboratory works at the interface of chemistry and biology to investigate the molecular and physical mechanisms that explain how exactly one copy of the genome is delivered to each daughter cell during cell division. If the metaphase spindle does not properly separate the parent cell’s DNA to the two daughter cells, diseases, such as cancer, and developmental defects, such as Down syndrome, may result. Dr. Kapoor is interested in understanding the fundamental mechanisms that allow cells to achieve this delicate balance between speed and accuracy. 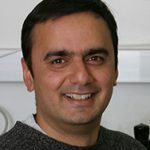 In addition to developing methods for the discovery, chemical synthesis and characterization of bioactive small molecules, Dr. Kapoor is establishing assays to study how the cell assembles the micron-scale structures necessary for cell division.